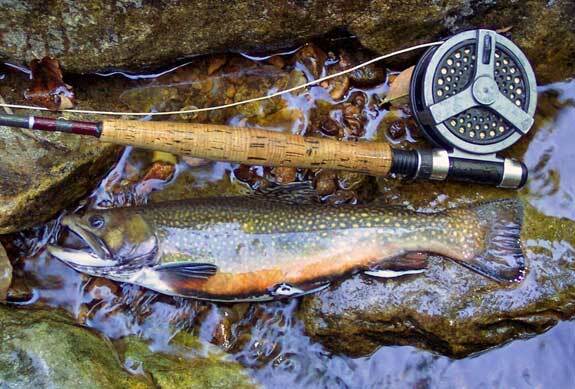 The Brook Trout is a popular species caught by fly-fishing Maine's lakes and rivers. Whether your passion revolves around catching the big one on the open ocean or casting a fly-line on a quiet lake, Maine has the fishing adventure just for you. Saltwater fishing is a staple along the craggy eastern coast that stretches for more the 5,500 miles from top to bottom. Freshwater fishermen will delight in the more than 6,000 lakes and countless ponds, rivers and streams hosting healthy fish populations. Maine is a fisherman’s dream, whether you’re a seasoned angler or picking up a rod for the very first time. One of the best ways to do some saltwater fishing in Maine is to join a charter boat or sign on with a registered Maine guide. Either way you will have experienced people eager to show you where to catch the big one. Saltwater species you might find on your hook include flounder, bluefish, Atlantic mackerel, shad, Atlantic halibut, pollock, redfish, Atlantic cod and rainbow smelt. Method of fishing, catch limit, legal size and season varies with each species. Usual saltwater fishing methods are casting and trolling. Striped bass are also a popular catch but they are more restricted than most species. If caught between May 1st and June 30th, you must use special gear and practice catch and release. From July 1st until November 30th you may keep the fish as long as they are of legal size and you haven’t gone over your catch limit. Fishing for bass the remainder of the year is illegal. Striped bass are most plentiful on the coast between Cape Small and Cape Newagen, and in the Kennebec watershed, including the lower portions of the Sheepscot, Kennebec and Androscoggin Rivers. Specialty charters take you at least 15 miles offshore in search of sharks. Mako and blue sharks are the most common. The largest mako caught in Maine’s waters weighed 680 pounds and the largest blue shark 391 pounds. While keeping a shark is legal if they are of proper size, the fisheries department recommends you practice catch and release, particularly with the mako. Anglers are encouraged to tag the shark if they can do it safely. Bluefin tuna are another monster fish that charter boats go after in the deep waters of the Gulf of Maine. The record for one of these super-fish, caught with conventional gear is 819 pounds. The season currently runs from early spring until fall but that is currently under review. Authorities encourage catch and release of bluefin tuna when possible. Taking part in one of the annual fish tournaments adds even more fun and excitement to your mega-fish adventure. Examples are the Annual Dockside Striper Tournament out of York Harbor at the end of July, the Annual Sturdivant Island Tuna Tournament out of South Portland the first week in August and the Downeast Maine Shark Tournament out of Saco the last week in August. Fishing in Maine’s many lakes, rivers and streams is a more tranquil experience. In the warmer seasons fly-fishing and casting are the way to go. Fishermen tend to have better luck in the early mornings and toward dusk, when the fish do most of their feeding. In the winter, frozen lakes and ponds become the perfect location to do a bit of ice fishing. Once the ice is thick enough, a hole is drilled down to water level. The fisherman places a baited line in the water and waits. Seasoned ice fishermen bring along portable chairs, snacks and thermoses filled with hot drinks. Some areas, like Moosehead Lake have ice shanties, or huts, for rent. These are little buildings positioned over a pre-drilled fishing hole. They do provide shelter from the wind while you are waiting for that togue, brook trout or landlocked salmon to take your line. Other fish active in the interior’s winter waterways are white perch and smallmouth bass. In the Rangeley Region, the native brook trout are a favored fish, as are the salmon and they populate many of the area’s lakes and waterways. The Androscoggin River feeds into this area. The 6,000-acre Rangeley Lake is also a good spot to troll for salmon, once the winter ice has melted. These fish can be tricky to catch, so your best bet is to hire a registered Maine guide. This part of Maine offers several cabins, motels and inns as well as marinas and other businesses that cater to anglers. Fishing is also good for wild salmon and brook trout in Mooselookmeguntic Lake. The Kennebago River, which feeds into the lake, is the nursery for most of the salmon in this lake. Catch and release is mandatory from August 15th until the end of the season in September. The Cupsuptic River and Richardson Lake are also fertile fishing grounds, with both having campgrounds nearby. The Belgrade Region, in the central part of the state is known for Northern pike, smallmouth and largemouth bass. This region includes parts of the Androscoggin and Penobscot Rivers and runs south to the Atlantic. Some of the largest landlocked salmon have been found in this region. Long Pond and St. George Lake also offer extended salmon seasons through the end of October. The Sebago Region is known for its fly fishing and offers the chance to catch salmon, lake trout, brown trout, brook trout or rainbows. Casting for bass also has good results. Most of this region is ice-free by the middle of April, which means an early start to the fishing season. May and June offer the best chances to catch bass and trout salmon because of the optimal water temperatures and the number of newly hatched insects in the area. Remember your bug spray. Introduce your family to the sport of fishing on one of Maine’s quiet ponds or lakes. If you don’t have your own gear, visit a local outfitter for everything you need, from fishing poles to boats. Warm water fish tend to be more active and easier for the little ones to catch. They tend to bite closer to the surface and leap about once caught, giving plenty of excitement for beginning fishermen, young and old. Fishing from shore is a great option for younger children. Be sure and take plenty of snacks and drinks, and even plan a game or two to keep them entertained if the fish aren’t cooperating. Sunfish and yellow perch are about the easiest to catch from shore. Both prefer shallow water, especially in areas with plenty of marsh weeds. For their small size, both fish are fighters and put on quite the show when caught. Most of Maine’s ponds and lakes have perch and sunfish populations. Maine has two types of fishing licences, freshwater and saltwater. Residents of Maine who are 16 years of age or older, or visitors 12 years of age or older must have a freshwater fishing license. Resident licenses are issued on a yearly or seasonal basis. Non-resident licenses are issued for as little as a day up to an entire fishing season. Junior fishing licenses for non-residents are available for children age 12 to 15. Maine maintains an additional Saltwater Recreational Fishing Registry. Registration allows you to fish along coastal waters including the tidal marshes. Anyone age 16 or older must register and pay a fee, with a few exceptions. One is if you are fishing from a charter or party boat operated by someone with a Recreational Operators license. Another exception is if you are fishing with a registered Maine guide that also has a Recreational Operators licence. You may also fish from a pier or dock owned by someone who has a Recreational Operators license. Anglers that have saltwater fishing licenses from certain states may be exempt from the registration requirement. Check with your home state or Maine’s Saltwater Recreational Fishing Registry to see if you qualify for the exemption. Rates for fishing licenses vary according to resident, non-resident, age of fisherman and length of time the license is good for. Fees usually range from $11.00 for the one day license to $64.00 for the seasonal license. Special combination fishing and hunting licenses are also available. Maine’s Inland Fisheries and Wildlife Service and the Department of Marine Resources encourage anglers to practice catch and release. If you are fishing for your dinner that’s one thing, if not, learn how to safely let the fish go. Some fish must be caught and released during certain seasons. Begin with using non-barbed regular steel hooks; they are easier to pull out and if caught in a more sensitive area of the fish they will disintegrate over time. Use a fine-meshed net to avoid injuring the fish’s eyes when caught. The best thing to do for the fish is to handle it as little as possible. Take out the hook, snap a quick picture and then put it back in the water. Hold it under the surface, moving it back and forth to mimic swimming. When the fish revives, let it go. Catch and release for larger saltwater fish works much the same way, but in the case of sharks and/or bluefin tuna, it takes someone with experience to do it safely. The wildlife agencies also encourage tagging of some species, usually done on licensed charter boats or on registered Maine guide fishing adventures.